On January 7, 2018, Auxiliary Bishop John O’Hara, a member of the Friends of the Erben Organ Advisory Council, celebrated a Mass at which he blessed a beautiful statue of Our Lady of China. The music included Chinese hymns, polyphonic motets, Gregorian chant, and more, with the Basilica’s Erben organ, played by Jared Lamenzo, and the 1859 Chancel Organ played by Yani Chen. We also had an ancient Chinese ceremonial gong on hand, which was on loan from the Basilica’s neighbor, Frank Andrews. The story in Catholic New York, written by Christine Chicoine, follows below. Yani Chen plays the Basilica’s 1859 Hall & Labagh chancel organ. Yani, who is 26 years of age, comes from Fuzhou, China and came to New York at age 18. 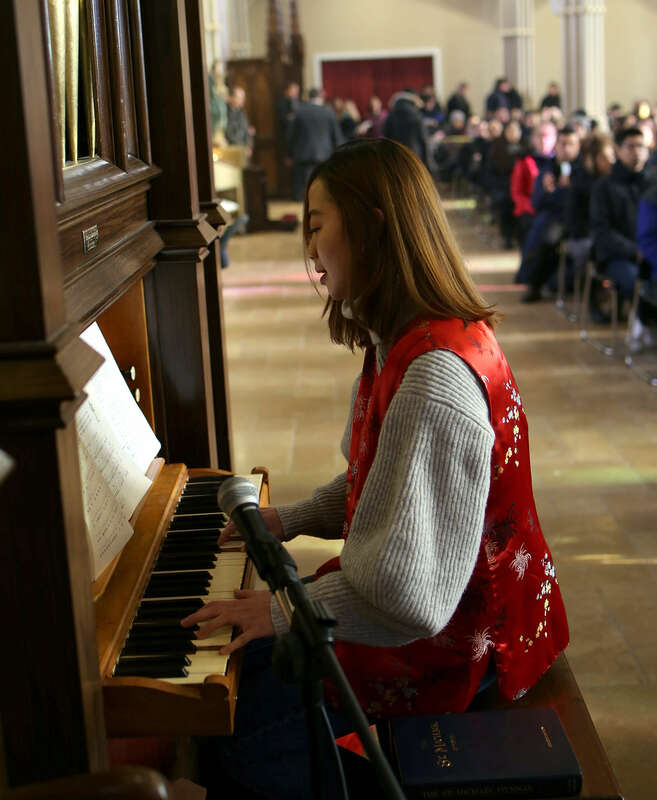 She learned to play piano in China beginning at age 12, and after some instruction from Organist Jared Lamenzo, applied her skills to the 1859 Hall & Labagh Chancel organ on the Basilica floor. Her mother loves music and singing and has encouraged her daughters to play at church and help the choir. A hand-carved wooden statue of Our Lady of China that graces the Basilica of St. Patrick’s Old Cathedral in lower Manhattan stands as a reminder that people from foreign lands have been, and continue to be, welcome on these shores. 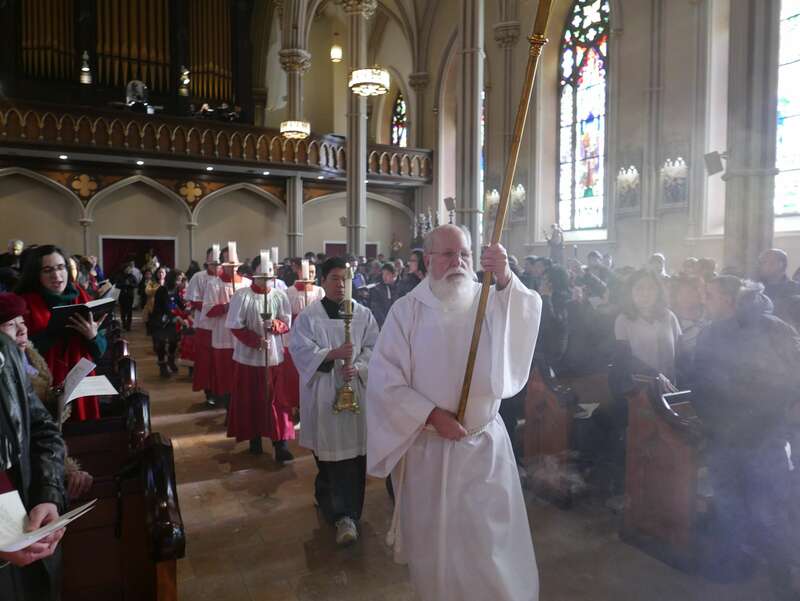 Auxiliary Bishop John O’Hara blessed the new statue at the conclusion of a Chinese-English-Latin Mass he offered Jan. 7, the Epiphany of the Lord. Concelebrating the liturgy were Msgr. Donald Sakano, pastor of the Basilica of St. Patrick’s Old Cathedral and the Shrine Church of Most Precious Blood, and Father Andrew Thi, a retired priest in residence. “This is a beautiful church in which to do this,” Bishop O’Hara said in his homily of the statue blessing, “because the very history of the Church, not only in the Archdiocese of New York but in the United States of America, is written” on the stones in the walls and in the windows of the basilica at Prince and Mott streets. “It’s always a place where the doors are open, it’s always a place that’s home. We welcome the refugee, the immigrant…folks who come here to hopefully achieve for themselves the American dream,” he added. Shengyang Wu, 30, a lawyer, who was born in China, told CNY that his 3-year-old son Solomon had a special prayer request to Our Lady of China before the Mass began. Pleased to see the many balloons that were part of the celebration, Solomon offered an innocent prayer at the statue: “He said in Chinese, ‘Mǎ lì yà (Mary), I want a balloon,’” his father said. And after the liturgy, the youngster repeated the prayer. At the conclusion of the statue blessing, the bundles of colorful balloons that Solomon had eagerly eyed were ceremoniously popped. Although firecrackers traditionally play a festive role in Chinese celebrations, the use of balloons instead of firecrackers was safer, Msgr. Sakano explained. As balloon remnants lay strewn on the floor and Solomon’s father suggested that perhaps next time Our Lady of China would make sure he got a balloon, Solomon simply said to Our Lady of China, “‘OK, see you next time,’” according to his father. Admiring the statue after Mass was the Cao family: Ji, 39, and his wife, Cui Juan Liu, 38, both of whom were born in China, and their sons, Jack, 10, and Louis, 8. Father Thi, at the reception that followed, shared with CNY his amusement that the statue of Baby Jesus cradled in the arms of the statue of Our Lady of China resembled his grand-nephew, 1-year-old Jasper. Father Thi, who was born in China, served as a parochial vicar at St. Patrick’s Old Cathedral from 1985, the year he was ordained, until his retirement in 2008. He was doing pastoral work in Vietnam when he fled that country in 1975 on a small boat with 50 other Chinese Catholics. At the reception, Father Thi also shared with CNY his own devotion to the Blessed Mother that began in childhood, and expressed his happiness that so many of the faithful attended the liturgy and blessing. “Thanks be to God, and the Blessed Mother,” he said. Msgr. Sakano, in remarks at the end of the liturgy, acknowledged his gratitude to Father Thi for his service to the Chinese community. “May Our Lady of China smile down on us, and guide us and Father Thai and the rest of his ministry here,” Msgr. Sakano said. 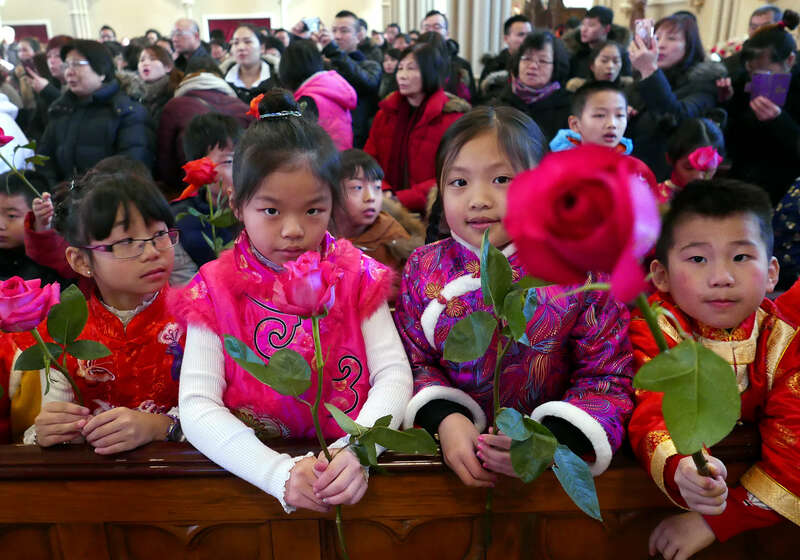 The creation and placement of the statue at St. Patrick’s Old Cathedral stems from the presence of a vibrant Chinese community under the leadership of Father Thi, according to Msgr. Sakano. In conjunction with the parish’s Renew+Rebuild campaign, the Chinese community raised more than $60,000 that it used to finish the adornment of the sanctuary as well as to pay for the statue of Our Lady of China. The statue cost $20,000. Carved in a studio in Ortesai, Italy, the statue is made of Linden wood and has an antique finish with gold leaf accents. The delicate textural details and patterns on the garments, typical in Chinese vestments, were done by hand.